Produits Neptune bathtub is a luxury bathtub that gives you a modern look and a complete massage. Neptune has a complete collection of products and accessories, in a simple and integrated concept that suits every style, from traditional to contemporary bathrooms. Produits Neptune provides inspiring, well-thought out product lines with enough flexibility for you to mix, match, and create your own chic, bathroom signature. With Produits Neptune, everything is possible, and everything is simple. It’s all yours to enjoy, a perfect balance of form and function. Bliss Bath & Kitchen presents you with a wide variety of quality name brand bathtubs to suite your style and budget.We provide you with the bathtub of your choice to transform your bathroom into what you have always dreamed it could be. Your bathtub is a long lasting investment, it’s not something you’ll replace anytime soon. It’s the main point of your bathroom redesign. The Rouge line from Produits Neptune provides inspiring bathtubs. Amaze: The Amaze collection includes Rectangle or Oval Soaking Tubs with Modern Styling beautiful, ergonomic and comfortable features harmonious angles and curves, with a large bathing well for pure pleasure. Ametys: Rectangular freestanding bathtub, modern in design thanks to its pure and simple lines. Ariane: This large corner bathtub has two very comfortable backrests and surrounds the bathers with sumptuous curves. Believe: Beautiful, ergonomic and comfortable, this rectangular bathtub features harmonious angles and curves, with a large bathing well and built-in armrests for pure pleasure. Berlin 3260 And 3266: The lovely curves of the Berlin bathtub form a figure 8 bathing well. Wide areas on the rim are perfect for mounting tub fillers. Cleopatra: A very large round bathtub that perfectly suits a large master bedroom. Daphne: An alcove-style bathtub with integrated skirt and tiling flange, ideal for any renovation project. Delight: This bathtub with molded backrest and armrests optimizes comfort and relaxation. A perfect choice for any renovation project. Elysee: An oval bathtub with subtle curves and two very comfortable upswept headrests. Felicia: A traditional-style oval podium bathtub. Florence: Florence tubs are designed as slipper tub with more modern styling. Gracefully curving backrests accent the oval shape. Jade: A rectangular bathtub with generous curves and backrests optimizing comfort. A pure design… and a touch of softness. Available Models 3872, 4272 and 4872. Julia: A very comfortable rectangular bathtub with integrated armrests. Kara: A total immersion bathtub offering contemporary, pure lines. Lauzanne: Modern Rectangle Tub for Use with Deck Mount Faucets. Perfect for the small bathrooms. London: The Rouge London tub is perfect for the small bathrooms with lengths of 60″ & 66″. A rectangle freestanding tub with curves. Macao: This bathtub of generous dimensions is equipped with an Ultim-O overflow assembly and offers an immersion up to 20 in. Malaga: The Malaga is an oval freestanding bathtub with slipper style raised backrest. Melia: This bathtub with molded backrest and armrests optimizes comfort and relaxation. A perfect choice for any renovation project. Available Models 3360 and 3466. Monaco: Rouge Monaco is a simply beautiful an oval freestanding tub with a narrow rim. Nagano: This japanese-inspired bathtub is very deep and allows for a total immersion. Nice: An Oval freestanding bathtub with a narrow rim. Orphee: This corner bathtub has two very comfortable backrests and surrounds the bathers with sumptuous curves. Osaka: This Japanese inspired two-seater bathtub is very deep and allows for a total immersion. Paris: Modern oval tub with a faucet deck. The end drain on the Paris bathtubs allows more room for legs than a center drain bathtub. Prague: A rectangle freestanding tub with a narrow rim. Revelation Oval: An oval bathtub combining straight and curved lines, very comfortable thanks to its two headrests and its integrated armrests. Revelation Freestanding: An oval freestanding bathtub combining straight and curved lines, very comfortable thanks to its two headrests and its integrated armrests. Ruby: This freestanding oval bathtub with skirt and Ultim-O overflow assembly offers an incomparable immersion. Available Models 3260, 3666 and 3672. Saphyr: A rectangular freestanding bathtub with a design softened by sumptuous curves. Tao: This podium-style oval bathtub is equipped with an Ultim-O overflow assembly and offers an incomparable immersion. Venus: This polygon-shaped corner bathtub is spacious and very comfortable thanks to its headrest and integrated armrests. Wind: This corner bathtub with rounded skirt and integrated tiling flange is ideal for any renovation project and allows for more space in the bathroom. Zen: A rectangular bathtub with pure lines, straight angles and contemporary style. Available Models 3060, 3260, 3266, 3272, 3466, 3666, 3672 And Zen 4272. Produits Neptune offers a complete line of bathroom products including Bathtubs, showers, shower bases, bathtub doors, toilets, sinks faucets, and bathroom accessories. Produits Neptune’s Products are unique collection of crafted components designed to fit together perfectly. Produits Neptune offers wide range of Canada-made bathroom products—bathtubs, showers, glass doors, sinks and toilets with a unique portfolio of refined equipment designed to blend seamlessly with all their units. Expressing the difference clearly, innovating with relevant product offerings, staying connected to customer needs. These are principles that reflect Produits Neptune’s intimate conviction that life is more beautiful when it is surrounded by beauty. They are the first company in North America to earn certification ECORESPONSIBLE. Produits Neptune provides inspiring, well-thought out product lines with enough flexibility for you to mix, match, and create your own chic, bathroom signature. With Produits Neptune, everything is possible, and everything is simple. Enhance your bathing experience by adding Produits Neptune massage systems. These five massage systems are Whirlpool, Mass- Air, Activ-Air or Tonic. For an array of massages and to maximize the sensation of well-being, it is also possible to combine these systems. Enhance your bathing experience by adding one massage system: Whirlpool or Activ-Air. For an array of massages and to maximize the sensation of well-being, it is also possible to combine these systems. Whirlpool System: The invigorating force of water and warm air. The Whirlpool massage system projects a powerful blend of water and warm air for a wonderfully invigorating sensation. Neptune Whirlpool massage is the most vigorous of all of their massage systems. With a forceful propulsion of water and warm air, it provides a deep tissue massage oxygenating your muscles, while stimulating your bloodstream and circulatory system. Combining neck, back, and foot massage results in an instant revitalizing experience. Back Jets: Enjoy back massage in the comfort of your own home. Surrender to back jets for that immediate release of tension in your back and shoulders. The Back Jets are designed with the expertise of massage professionals in mind, they work in combination with the Whirlpool system. Located strategically in the bathtub’s backrests, micro-rotating back jets energetically propel the water onto critical parts of your back and shoulders. Water pressure can be adjusted according to your specific needs. Mass-Air System: The peaceful feeling of a cushion of warm air. Mass-Air systems create a delightful experience of softly floating on a cushion of soothing bubbles for a gentle, relaxing massage. Customize your experience by adjusting the system’s intensity. The Mass-Air system propels warm air into the water through injectors located on the bottom and on the backrests of the bathtub. Activ-Air System: The Activ-Air massage system recreates the stimulating effect of bathing in the oxygenated water of rapids. As a gentle and soothing swirl, the Activ-Air system maximizes the therapeutic effects of relaxation. The Activ-Air massage system includes dozens of micro-injectors strategically located along the bottom of the bathtub contour and in the backrest. Warm air is then injected into the water creating thousands of bubbles completely enveloping your body. Tonic System: Neptune’s Tonic massage is the quietest system in the industry, combines water and warm air to immerse you in comforting bubbles. Three pre-programmed cycles allow you to adjust the intensity of the bubbles, and each produces a sensation embracing your entire body. The system can be customize according to your taste and needs. 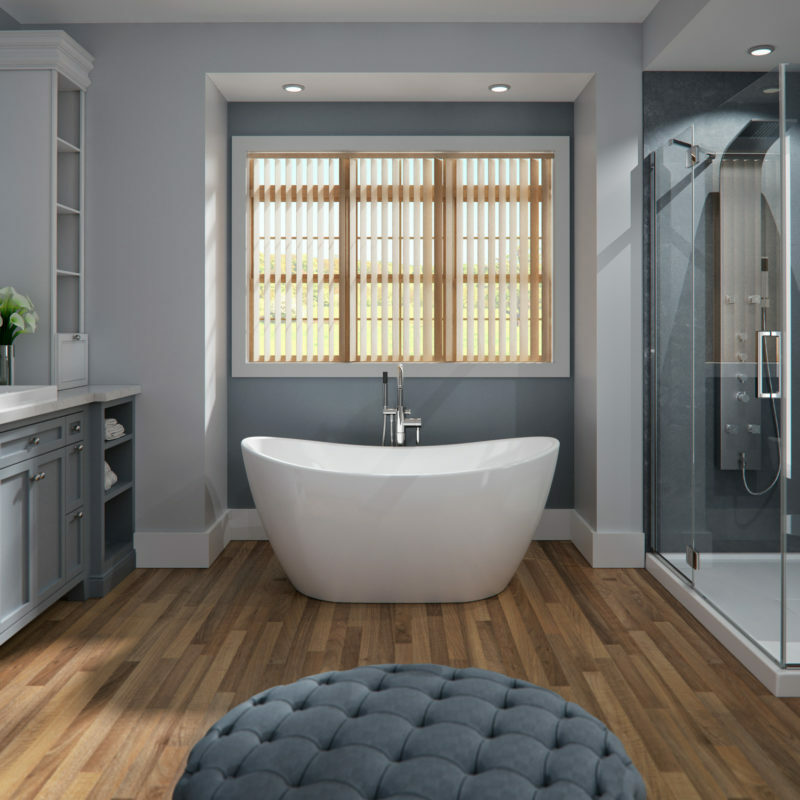 Our collection of bathtubs are categorized as Freestanding, Clawfoot, Corner, Oval, Round, Rectangular, Japanese Tubs, Non-Standard Tubs and walk-in Bathtubs / Barrier Free Tubs. Feel free to contact one of our qualified professionals to get any of your questions answered. We ship to all over Canada and the USA. Buy bathtubs Online from us with confidence. Call Bliss Bath And Kitchen at (905) 944-0330 or Toll Free: 1-855-366-1001 or email us at admin@blissbathandkitchen.com if you have any questions.